We manufacture a wide variety of bags and pouches to accommodate all types of things like documents, folders, envelopes, x-rays, charts, patient records of all different sizes and shapes. These style bags are very useful for inter-office transportation and are also used for courier service of all types. They can be made with a non-locking zipper if security-privacy is not a concern or you can have any bag built with a locking type slider/zipper such as a DSPDL-1. This is very useful where both the shipper and receiver can both have a key and the middle man/transporter does not need access to the contents. These style bags/pouches are an ideal choice for the transportation of patient files and records for reasons of confidentiality and privacy which is now required pursuant to the newly imposed HIPAA (Health Insurance Portability and Accountability Act ) regulations. These bags come with a sewn on clear window, which is on the outside of the bag. The stock window is made it accommodate a 2" x 4" card, which is the size of most standard business cards. We can make any size custom window if a larger one or specialty size is required for your operation. We can build any size bag you need so please contact us with your special needs and requirements and we will do what is needed to help you accomplish your intended task. 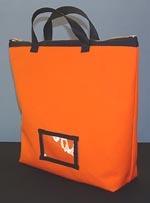 Bags can be made in many colors and various types of fabric and will be priced accordingly.